Whenever Archbishop Ieronymos finds time off, he rests and relaxes by looking after the animals in the Monastery of Saints Theodores in Zaltsa of Boeotia. Metropolitan Maximos of Ioannina spends his free time listening to music on YouTube. Metropolitan Dionysios of Corinth takes walks in the mountains, while the Metropolitan of Mantineia is a farmer whenever he is not occupied with his ecclesiastical duties. Most Metropolitans - due to their cassock and position - are considerate and dedicated to their duties. They spend endless hours at the offices of their Metropolises and participate in liturgies and sacraments. They are committed to serving God and the faithful, although they also have another side, more human. Many spend their limited free time on their favorite hobbies. They listen to music, read literature, exercise, grow plants and deal with new technologies. Archbishop Ieronymos has a busy schedule everyday. He meets with people morning till night, and attends lectures and is an endless signer of documents. Thus, he reminisces of taking breaks at the Boeotian countryside when he was Metropolitan of Thebes and Livadia. The province has missed him. So whenever the opportunity presents itself, he steals a little time and goes to the Monastery in Zaltsa. There he rests, enjoys nature, and gets away from his administrative tasks by feeding the animals of the Monastery - the hens, goats, sheep and rabbits. He used to engage himself in the cultivation of the Boeotian land. Plowing and grafting is agricultural work that he knows well. He is handy, which is why he likes to tinker with things. 38 years ago he built brick by brick the Church of Saint Marina on the small island of Ampelos off Corinth, with the current Metropolitans of Thebes and Ilion, who were then priests. When there isn't enough time for a trip to Zaltsa, the Archbishop takes time to write. The germ of archaeology never left him. Having studied Archaeology and having a background next to the world famous Archaeology Professor A. Orlando, he has not stopped writing about Christian monuments. In 2005 he published the book Christian Boeotia, a travel guide to the monasteries of the region. When he was Metropolian of Thebes, he went up the mountains with his old Volkswagen documenting abandoned half-ruined monasteries and chapels with an aim towards their restoration. Now he's preparing the second volume and gathering data for the third. Meanwhile, in 2012 he published another book, the study Ecclesiastical Property and the Payroll of the Clergy, and in early 2015 the continuation titled The Salaries of Parish Clergy in Greece. Metropolitan Athenagoras of Ilion, Acharnon and Petersburg is fond of theater and cinema. But now his visits to the cinema and theater are very rare since his schedule at the Metropolis is very busy. As he says: "When I have the opportunity, I go with a group of clergy to see a movie - which offers something to reflect on - and after we discuss it." In the half hour or one hour of free time he may have in a day, he prefers to read a book, "especially something lighthearted, such as literature or even theology." Metropolitan Hierotheos of Nafpaktos does not randomly have the nickname "Scholar of the Hierarchy". He has turned his favorite hobby, writing, into a science. He is a phenomenon of a Metropolitan, and his output as a writer would be the envy of any university professor. He has written 84 books on theological, ecclesiastical and social content, based on the teachings of the Holy Fathers. Of these 71 have been translated into 24 foreign languages. Among these are Arabic, Swahili, Chinese, Finnish, Georgian, Urdu-Pakistani and Korean. A year ago a book became a bestseller in South Korea. In May last year he did a signing for four hours for his books in Romania. "I write continuously. It is my hobby," he says. And continues: "I present Christianity within contemporary philosophy, psychology and sociology." "Free time? Where would I find it! The 'electric chair' of the bishop - this is how I call it - does not leave me much time," says the 62 year old Metropolitan Dionysios of Corinth while laughing. Whenever he does have spare time, he says that he will either read or listen to music. "I listen to everything, like folk and island music. Even rock music. I grew up in the time of the Beatles." Other times, if it is possible, he prefers to exercise. "I go by myself to walk or run in the mountains. I also like to swim in the sea, but I do this very rarely." Music is the hobby of Metropolitan Maximos of Ioannina. He has studied European music and enjoys listening to music of all kinds from his computer via YouTube. Also, he is an excellent handler of new technologies. Before becoming Metropolitan of Ioannina, he communicated regularly with young people via social media. The 78 year old Metropolitan Alexander of Mantineia and Kynouria devotes his free time in the land of Arcadia, where his hobby is to hoe and take care of the fields of monasteries with their vegetables and potatoes. "I'm a villager and I love to do fieldwork. It satisfies me more to be in the field than in the office," he says. He continues: "My philosophy is to avoid leaving any field abandoned in a monastery. So we are trying with some clerics to keep them alive. What we produce - potatoes, wine, olive oil - go to the institutions and people of the metropolis in need, to the Basket of our Poor Brethren." He has utilized the estates of the Monasteries Paleopanagia, Artokostas, the Forerunner and Sintzas. He is among the youngest of the hierarchs, and for the moment he says that he doesn't seek to have free time, but to be effective in his new duties - he was elected Metropolitan last year. "But when I get time and a suitable venue, I like to deal with art. With iconography and calligraphy. I was involved with them when I was a monk. I want to build a laboratory," he notes. Metropolitan Mark of Chios is a fan of athletics and does not miss the European and World Championships when broadcasted on television. Metropolitan Anthimos of Alexandroupolis searches for and purchases items from old Constantinople as a hobby. Metropolitan Joel of Edessa composes new church services. 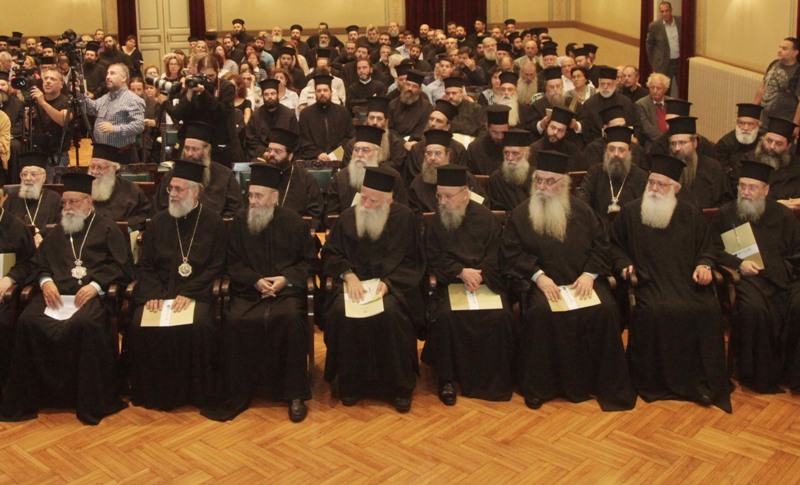 Metropolitan Ambrose of Kalavryta is known as the "Gadget Guy of the Hierarchy". He handles the computer and mobile phone with great comfort and uploads his own texts on his blog, which is his hobby. He likes to own whatever is the latest. In the previous meeting of the Holy Synod he had his tablet and tried taking pictures. For Metropolitan Dorotheos of Syros, Tinos, Andros, Kea and Milos, there is no luxury of free time. He oversees 12 islands that he frequently visits. "The little time I have I choose to dedicate to four small children 2-9 years old who are next to my diocese. I go there, nestle them in, help them with their homework, take care of them and protect them." Several Metropolitans in their respite from administrative and pastoral duties prefer to collect things, relax and read. Metropolitan Timothy of Thessaliotidis and Fanariofersala reads about sociological, theological, inter-Orthodox and inter-Christian matters. "It is necessary to do this for my episcopal duties." Metropolitan Prokopios of Philippi, Neapolis and Thassos says that the pastoral care of the prelate is of an indefinite time and at least 12 hours of his day is at the disposal of the faithful. "As a citizen and Metropolitan I am obligated to follow the news to be on top of things," he says. Previously, during the summer, he would spend time fishing in Thassos. The 44 year old Metropolitan Panteleimon of Maronia and Komotini reads, especially the lives of the saints, and he dedicates time to pray during his limited free time. But he loves sports. He has made his appearance in the stands of the stadium to watch the soccer matches of Panthrakikos. Metropolitan Ignatios of Demetriados, when he has free time, likes to find peace in a monastery or house. The duties of a bishop of a province are more demanding, he says. "We must be present for sacraments and events. Especially now with the crisis we must always be close to the people." However, he does like walking, and he prefers to do this "if I happen to be on a trip abroad. It is easier. No one can then constantly stop you in the street. Foreigners are more considerate."